MISSISSIPPI THUNDER SPEEDWAY officially concluded its 2011 season with the Awards Banquet which was held at the Riverport Inn & Suites in Winona. With the Christmas weekend quickly approaching, a great crowd was on hand to celebrate the drivers and sponsors who made the season a success. Tons of door prizes were up for grabs for everyone in attendance at the banquet, not just the drivers. The drivers though were also eligible for a congratulatory gift certificate from Les Duellman Racing Equipment. This was not only to the top five drivers either. In addition to thanking the drivers, sponsors, and fans, promoter Bob Timm clarified the classes that the track will run in 2012. Additionally, Timm briefly talked about the tentative 2012 schedule . . .
MISSISSIPPI THUNDER SPEEDWAY PREPARES TO HAND OUT THE CASH!! 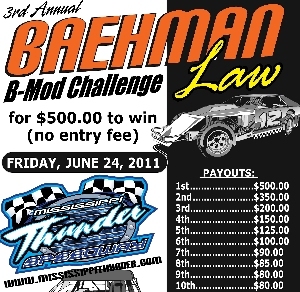 MISSISSIPPI THUNDER SPEEDWAY is excited to announce the recipients of The 2011 BAEHMAN LAW B-MOD POINT FUND!! 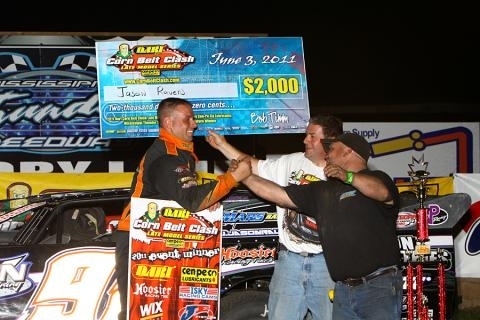 As announced on March 29th, 2011, USRA B-Mod racer - and class fan Jack Baehman decided to fund an unbelievably generous point fund for the USRA B-Mod class for the 2011 season. Thus was born the The 2011 BAEHMAN LAW B-MOD POINT FUND. The 2011 BAEHMAN LAW B-MOD POINT FUND awards checks will be presented during the 2011 MISSISSIPPI THUNDER SPEEDWAY CHAMPIONSHIP AWARDS BANQUET scheduled for Saturday December 17th at the Riverport Inn & Suites located in Winona, MN. "I can't even begin to explain just how fortunate the USRA B-Mod racers are to have a supporter such as Baehman Law at MISSISSIPPI THUNDER SPEEDWAY," said speedway owner Bob Timm, "and any time we can find a way such as this to reward our regular drivers by putting a little extra cash in their pockets, is a win-win situation for all involved. 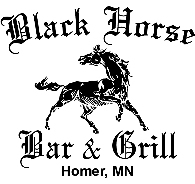 We all owe a HUGE Thank You to Jack Baehman and Baehman Law!" for gathering the lowest point total although still participating in all of the POINT FUND races! Congratulations to all B-Mod drivers who competed towards The 2011 BAEHMAN LAW B-MOD POINT FUND! TWO DAYS, TWO SHOWS - MANY WINNERS!! MISSISSIPPI THUNDER SPEEDWAY once again had the distinct pleasure of hosting the final points paying event for the 2011 season for both USRA A and B Modifieds as well as WISSOTA Super Stocks, WISSOTA Street Stocks and WISSOTA Midwest Modifieds! Along for the ride during this years two-day season ending special event, were the "A" & "B" Sunshine Sanitation Midwest Mini Mods & REDBOX 600 Mods! With the season finale at MISSISSIPPI THUNDER SPEEDWAY came over 160 cars to compete at the Western Wisconsin oval for Friday Evening's portion of the two-night affair. National Championships were being chased for the USRA B-Mods with the top three contenders in attendance. The WISSOTA Super Stocks and the WISSOTA Street Stocks also had the top two in each division present to duke it out for their national titles, and duke it out they did . . .
With Friday's action completed, the pits were almost bursting at the seams for Saturday's final on-track action at MISSISSIPPI THUNDER SPEEDWAY and the racers were bursting with anticipation to hit the high-banks and sweeping turns. With new National Champions needing to be crowned in two WISSOTA divisions and a tight battle for national points in the USRA B-Mod division the race fans in the grandstands were amped up as well for a night of action . . .
Read both of Tracy Hager's post-race write-ups . . .
With $10,000 on the line, NASCAR pro Kenny Schrader in the field, and fireworks flying in the sky, the 31 qualifiers took to MISSISSIPPI THUNDER SPEEDWAY in the 2nd annual USRA Modified Nationals, presented by Elmer's Auto Salvage. Fifty laps later, Winonan Keith Foss had 11,000 reasons to be smiling!! TESCH TOPPLES USMTS TITANS AT MISSISSIPPI THUNDER SPEEDWAY! WAITS ROLLS TO USMTS WIN ON NIGHT NUMBER TWO OF RIVER CITY RUMBLE AT MISSISSIPPI THUNDER SPEEDWAY! GUSTIN CRUISES TO USMTS WIN ON NIGHT NUMBER ONE OF RIVER CITY RUMBLE AT MISSISSIPPI THUNDER SPEEDWAY! SCHOTT SWEEPS; SCHWEBACH SEES THE VIEW FROM VICTORY LANE AT MISSISSIPPI THUNDER SPEEDWAY! The Dart Challenge Series for WISSOTA Late Models event arrived at Mississippi Thunder Speedway, and in more ways than one, Jake Redetzke proved that lightning does strike twice in the same place. Redetzke not only sailed to the big win ahead of 28 other competitors, he back-to-backed the win from Thursday night and also from last year as he was the reigning champion of the event. Elite Shock Services jumped on board to present the 2nd Annual Street Stock Summer Nationals at Mississippi Thunder Speedway to open up the extended Fourth of July holiday weekend. As the showcase class, the WISSOTA Street Stocks did not disappoint - with out-of-towner Jay Kesan claiming the huge $1500 paycheck as the Summer Nationals Champion. ANDERSON GRABS SECOND CONSECUTIVE BAEHMAN LAW B-MOD CHALLENGE WIN AT MISSISSIPPI THUNDER SPEEDWAY!! Jack Baehman of Baehman Law was the host sponsor for the 3rd Annual Baehman Law B-Mod Challenge at MISSISSIPPI THUNDER SPEEDWAY. In an extra-money show for the TheEngineStore.com USRA B-Mods, 21 cars vied for the big check with Ben Anderson taking home the money for the 3rd Annual Baehman Law B-Mod Challenge for TheEngineStore.com USRA B-Mods. 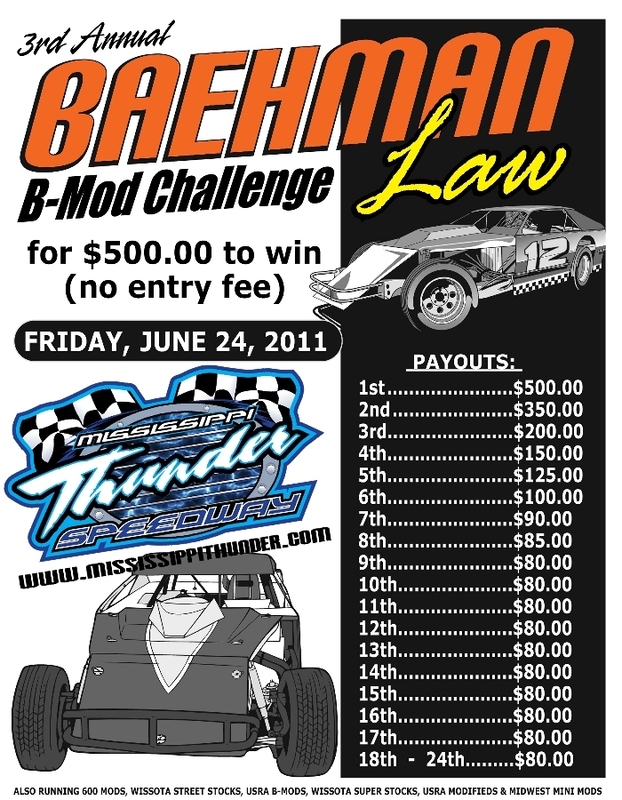 3rd ANNUAL BAEHMAN LAW B-MOD CHALLENGE COMING TO MISSISSIPPI THUNDER SPEEDWAY! The action is ready to boil over this Friday night at MISSISSIPPI THUNDER SPEEDWAY as the 3rd Annual BAEHMAN LAW B-MOD CHALLENGE returns for top-notch on-track battles for big bucks and big family fun! In addition to the high-speed action on the track, we'll also be giving away two bicycles (one boys and one girls bike) for young race fans in attendance! Big Payouts, larger car counts, more family-friendly prizes . . . and NO INCREASED ticket prices!! LAWSON CRUISES TO FIRST WIN AT MISSISSIPPI THUNDER SPEEDWAY! And into the month of June we go at MISSISSIPPI THUNDER SPEEDWAY with a complete turn of the thermometer as temperatures surged into the 90's, and the on-track action was heated as well. Jason Raun topped the traveling series in the Dart Corn Belt Clash Late Models as they ended a three-day run from Tipton, Iowa to West Union, Iowa to Fountain City, Wisconsin. Also hot was Drew Lawson as he turned his ninth place starting spot into his first feature win at MISSISSIPPI THUNDER SPEEDWAY. MISSISSIPPI THUNDER SPEEDWAY ADDS 600 MODS TO JUNE 30TH/JULY 1ST TWO-DAY SPECIAL! With sponsorship assistance from Joe Signs (WISSOTA Challenge Series Sponsor on Friday July 1st) MISSISSIPPI THUNDER SPEEDWAY is happy to announce that the growing Oakridge Fabrication 600 Mod Division has been added to both nights of the two-day special. 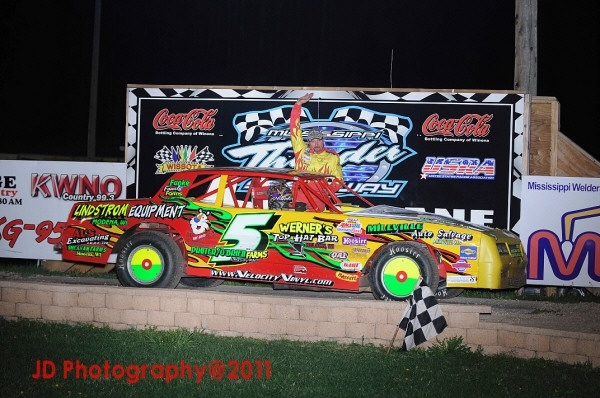 On Thursday June 30th the 600 Mods will join the Jailhouse Saloon WISSOTA Street Stocks & WISSOTA Late Models as part of the scheduled line-up for the 2011 Street Stock Summer Nationals! In 2010, the Street Stock Summer Nationals was a HUGE success, providing some of the best Street Stock racing of the entire summer! Additionally, the Oakridge Fabrication 600 Mod Division will join the "A" & "B" Sunshine Sanitation Midwest Mini Mods, Jailhouse Saloon WISSOTA Street Stocks, TheEngineStore.com USRA B-Mods, River City Manufacturing USRA Modifieds & WISSOTA Late Models on Friday July 1st as part of the scheduled line-up for the $3000.00 TO WIN WISSOTA LATE MODEL CHALLENGE SERIES special event, presented by Joe Signs and Joe Provo Racewear! Come join in the fun during the two-day extravaganza, as pure power thumps the straight-aways and set-up supremacy dominates the wide sweeping turns of MISSISSIPPI THUNDER SPEEDWAY! Check the SCHEDULE PAGE for more 2011 season information. 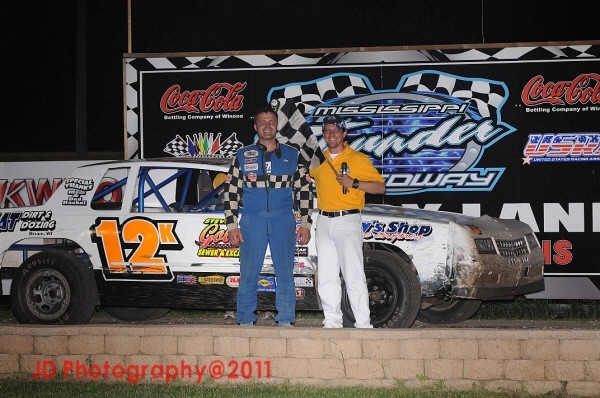 In preperation for the quickly approaching 2011 season, MISSISSIPPI THUNDER SPEEDWAY is asking all drivers who plan to compete at MISSISSIPPI THUNDER SPEEDWAY this year to fill out our 2011 DRIVER PROFILE FORM. The form is available here, drivers can print it out and bring a completed copy with them on their first visit to the speedway (preferably at the 2011 practice session Friday April 15th). prior to April 12th to avoid a long line at registration on Opening Night. Jack Baehman, Owner of Baehman Law, has been a lifelong race fan and a tremendous supporter of MISSISSIPPI THUNDER SPEEDWAY for the last couple of years. Jack is a firm believer in the USRA B-Mod class but understands how difficult it can be for the average racer to make ends meet throughout the course of the race season. MISSISSIPPI THUNDER SPEEDWAY would like to remind all USRA B-Mod racers of a current TECH ALERT. USRA B-Mods must have a minimum Panhard bar length of 19" for the 2011 racing season. This was originally understood to be for backside bars only but MISSISSIPPI THUNDER SPEEDWAY has clarified with the USRA Tech, and it in fact includes J-Bars and front side Panhard bars as well. For further clarification, please consult the official USRA B-Mod Rules. ACTION THUNDERS ON AT MISSISSIPPI THUNDER SPEEDWAY! CORNBELT CLASH LATE MODEL SERIES PREPARES FOR THEIR 2011 MISSISSIPPI THUNDER SPEEDWAY APPEARANCE! Sunshine Sanitation Midwest Mini Mods, TheEngineStore.com USRA B-Mods, Winona Auto Sales WISSOTA Super Stocks, & River City Manufacturing USRA Modifieds scheduled to join in the evening's action! 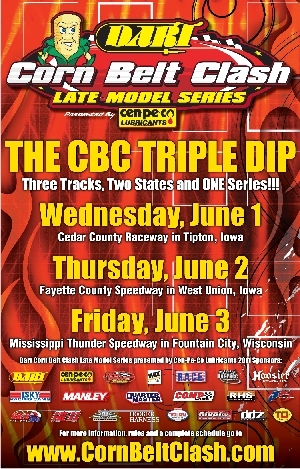 The DART Corn Belt Clash LATE MODEL SERIES, Presented By Cen-Pe-Co Lubricants, prepare for their much anticipated visit to MISSISSIPPI THUNDER SPEEDWAY on the 2011 season schedule! 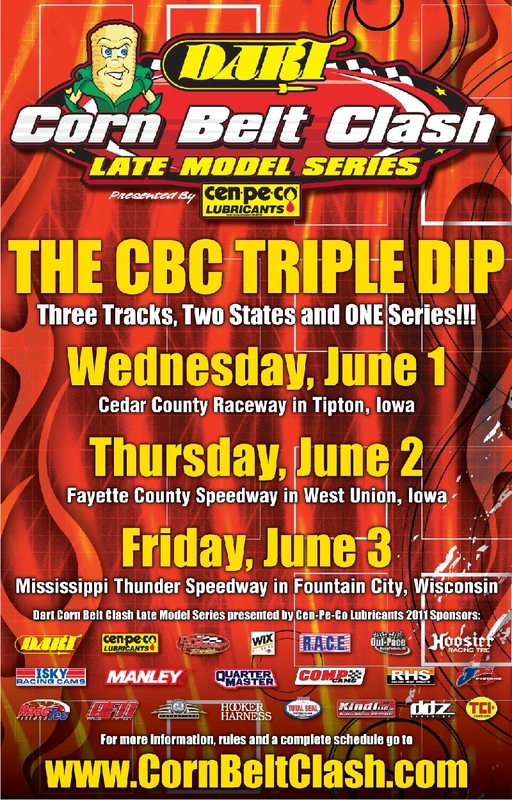 As part of the "CBC TRIPLE DIP" the series will visit three tracks in two states over a three-day swing that ends up at MISSISSIPPI THUNDER SPEEDWAY on Friday June 3rd! GANZ AND FOSS COLLECT COMEBACK WINS DURING WEEK 3 ACTION AT MISSISSIPPI THUNDER SPEEDWAY! HANSON GOES BACK TO BACK DURING WEEK 2 ACTION AT MISSISSIPPI THUNDER SPEEDWAY! 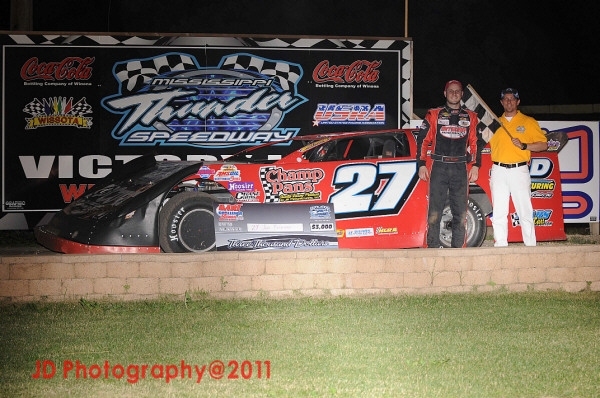 FOSS, EARNEY, KANZ, HANSON, & MATEJKA STAMP OUT FEATURE WINS AT MISSISSIPPI THUNDER SPEEDWAY 2011 SEASON OPENER! 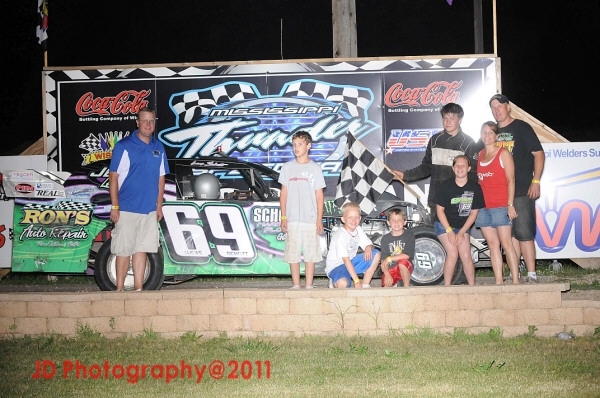 2011 MISSISSIPPI THUNDER SPEEDWAY CAR SHOW - A GREAT SUCCESS! MISSISSIPPI THUNDER SPEEDWAY officially kicked off the third season of action at what is quickly becoming one of the hottest speedways in the Upper Midwest with the Second Annual MISSISSIPPI THUNDER SPEEDWAY Car Show! For the second year in a row, racers and race fans alike were invited into the warm dry interior of Sugar Loaf Ford, in Winona, on Saturday March 26th to enjoy the first official unveiling of racing hardware which has been prepped to hit the track during the 2011 season! MISSISSIPPI THUNDER SPEEDWAY RELEASES PRELIMINARY 2011 SEASON SCHEDULE! MISSISSIPPI THUNDER SPEEDWAY released the preliminary 2011 season schedule - a summer long celebration of dirt track action! Included in this initial schedule release are weekly dates for the M.T.S. 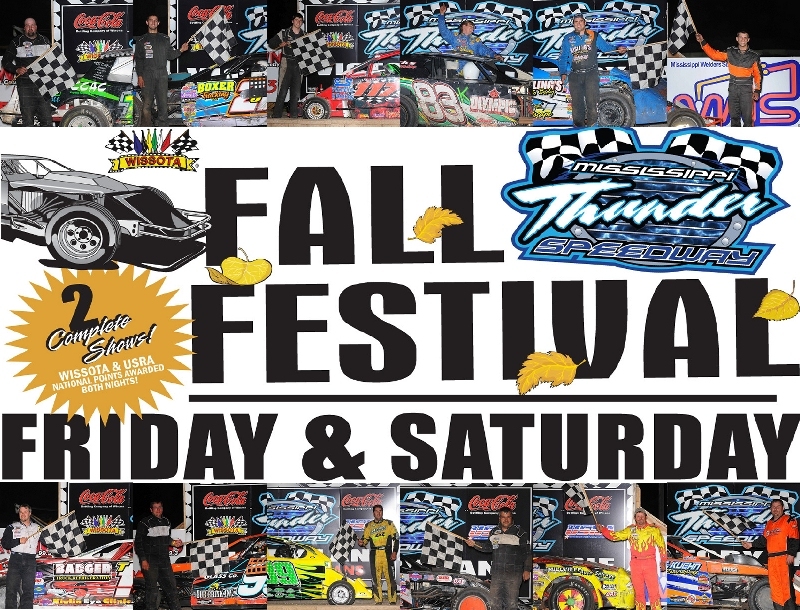 divisions that racers and fans alike have come to enjoy, as well as several eye-opening additions (including LATE MODELS, SPRINT CARS & MORE ) that should raise the excitement level of everyone thinking of visiting M.T.S. this summer! Take a look at the PRELIMINARY 2011 SCHEDULE by visiting the SCHEDULE page here at the OFFICIAL web site of MISSISSIPPI THUNDER SPEEDWAY - MississippiThunder.com! !